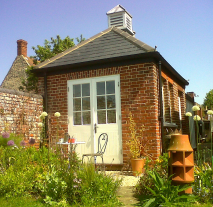 The Wash House Studio is hidden in the middle of Orford with easy access to all the local shops and restaurants. We are located just off Quay Street and there is off-road parking for you. It is a separate building from our main house and stylishly converted in recent years. It has views of Orford Ness from the outside space which is reached via the French doors. The outside area has a table and chairs and opens out on to our meadow which you are free to explore. We offer bed and breakfast which includes fruit from our garden, local bread, croissants, apple juice, eggs, yoghurt and preserves and, of course, real coffee or tea. This will be delivered to your door at an agreed time. We also offer bed and no breakfast as some guests prefer to go the the Pump Street Bakery or the Riverside Tearooms for breakfast. There are tea and coffee making facilities with fresh milk and we provide some small welcome cakes. Toiletries are by the Suffolk Company, Honeybee and the linen and towels are white Egyptian cotton from The White Company. 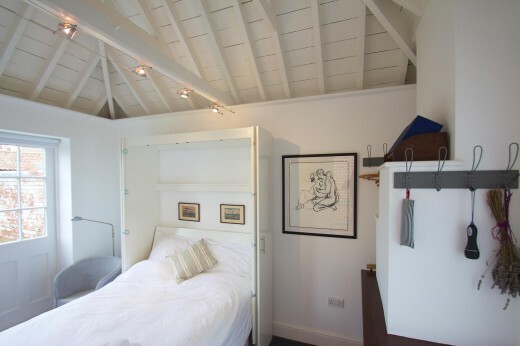 The accommodation has a double wall bed which is very easily folded into a cupboard to allow more space during the day. There is a glazed lobby with table and chairs and an en suite with wet-room shower, toilet and basin. Sorry we will not be taking pets because of allergies. There is under floor heating for when it gets chilly and TV and Wifi are installed.